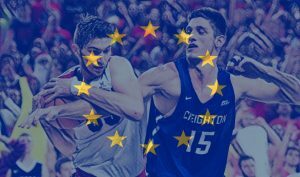 When we take a look at the European players in Division I basketball, it is possible to notice some different themes among the various nationalities. For example, the Serbians are always loaded with interesting players; the Italians are getting better year after year; the French have much talent that will likely unfold on a long-term period. However, Spanish student athletes are arguably those who are doing better in this season, as a whole. That’s why we wanted to hear from someone who regularly keeps an eye on these players and knows them from before they moved to the US. 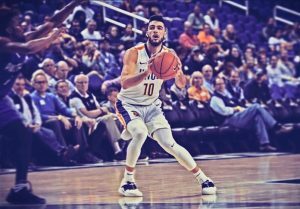 Here’s our conversation with Gonzalo Bedia Diaz, an Assistant Coach at Saint Louis College of Pharmacy (NAIA) and analyst for BPM (Basketball Player Media). There is much to be excited about this season for Spanish CBB fans, with four players that have a major role on their team, including a big, nice surprise like New Mexico State’s Iván Aurrecoechea (11.1 points, 5.8 rebounds). 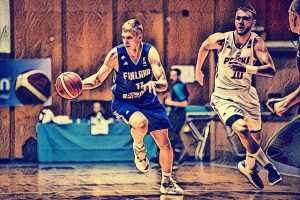 Last week, he had a great performance against GCU (20 points, 11 rebounds) in a not-to-be-missed Euro match-up against Alessandro Lever. Aurrecoechea is not a surprise anymore, after the number of good games that he had so far, including the one with Kansas (14 points, 6 assists): you always expect him to have a certain impact. He’s the kind of underdog that one has to love: as a prospect, he’s pretty old for being a junior (he turned 23 last November), not very big for his role or much versatile on offense, but has some really solid low post moves and he’s extremely tough and smart, even unpredictable at times. Gonzalo Bedia Diaz – Also, he’s a good passer. The connection with the other post players is really good. The energy he has on the court, the hustle, how he fights for every single ball, is going to give him credit for when he will be a pro. I know he should be more versatile or at least develop a mid range shot, but he has still time for that. It’s one of the things he’s going to focus on this summer. I’m super glad, I didn’t expect these performances from him this season. He used to play for a pretty good JUCO, Indian Hills, together with another Spanish guy, Javier Valeiras. He was better than him, but Valeiras had a pretty good season as well. It’s interesting how coming both from same JUCO, Aurrecoechea ended up in D-I having a key role for the Aggies and Valeiras is now in D-II barely having opportunities. You never know. We have to give credit to Iván: he’s showing that he’s able to give a lot of things to the team, but sometimes it depends also on the team you end up in. It’s clear that Coach Chris Jans trusts him. And I understand that, because he’s the kind of player that any coach would love to have on his team. UNC Greensboro’s Francis Alonso is still the most important Spanish player. He’s an All-Conference caliber player – possibly a POY candidate – in the SoCon and there’s also this back and forth between him and Stony Brook’s Akwasi Yeboah as the top European scorer in D-I (right now, Alonso is averaging 17.8 PPG; Yeboah, 17.9). He’s known mostly for being a great shooter (37.6 3P%, has always been around or above 40% in the three previous seasons) and he doesn’t get enough credit for other aspects of his game: how would you describe him, as a whole? I’d say that his self-confidence is his clearest quality. He’s smart and can do lots of stuff. He’s a very good passer, he reads the game pretty well without the ball. If he’s double teamed, he can find the open guy. He has a wide range of action: he has a mid-range pull up, he can even be a slasher. Defense used to be his biggest weakness and I say that he improved a lot since he’s in the United States. I mean, I’ll never say that he’s the best defender on his team but now he’s a pretty consistent defensive guy. Juan Carlos Navarro comes to my mind: has always been a scorer and, with the time, he became a decent defender, just being smart. The way you’re describing Alonso’s path reminds me a lot of what is going on right now with our fellow Italian Davide Moretti. A small combo guard, defense has always been his weakness but he has improved a lot at Texas Tech. Not a lockdown defender, but someone who knows how to play in a certain system. In the NCAA, if you don’t play defense, it doesn’t matter if you score, because you’re not gonna play. The game is more physical and faster. You need to adjust: Alonso did and he’s doing well. Speaking of Spanish players in the SoCon, there has been a really enjoyable match-up between Ramon Vila (11.5 points, 4.9 rebounds) and Rubén Guerrero (14.8 points, 8.2 rebounds) in Chattanooga-Samford. It was fun to watch them playing against each other. They both played well, especially Vila. Guerrero is a valuable big man, he’s comfortable with using both hands in the low post, but this time, on defense, Vila was a difficult match-up for him. He’s smaller but so tough and smart, plus he has a good mid-range jumper that wasn’t very easy to guard for a 7-foot guy like Guerrero. Yeah, they’re absolutely different players. This year’s version of Rubén is much different compared to the one that we have seen at South Florida. He has more minutes, more trust from his coach, he has improved a lot physically. He gained a lot of muscles and that was one of the things he struggled with at the beginning in the US. He was a super skinny guy, even though he was very athletic. He helps the team a lot in terms of rebounding and he runs the court pretty well for a 7-foot guy. On the other hand, we have a guy like Vila. Being just 6-foot-8, he wouldn’t be playing if it wasn’t for his high basketball IQ. I loved him even when he was in Spain, he had experience playing against grown ups in 2nd division with Barcelona. That was a good thing for him. Ruben, on the other hand, came here in the States a little bit younger, playing at Sunrise Christian, and hadn’t that kind of experience. As you said, Ramon has more range of action, he could even shoot 3s but he’s not allowed by the coaches at Chattanooga because they rather want him to get close to the rim. In fact, he shot his first (and so far, only) 3-pointer of the season in that game. But I promise that he can make those. In the future, when he’ll be back in Europe, he can be more versatile than what we’re watching now. Maybe in a high-major his position wouldn’t be so specific like in Chattanooga. I’m super glad for Ramon that he’s doing well right now because he struggled a lot when he was at Arizona State. Yeah, you can tell he’s hungry, like he has something to prove. As you said, he’s a smart player, but he also has high motor, he can be relentless on the court. A player like him, who is so aggressive but also makes so few mistakes, is not much common. It’s like he needs to show to his former team what they’re missing. Let’s talk about a less experienced player now. GW’s Javier Langarica has struggled in the first part of the season, then had a huge game against American (15 points, 12 rebounds, 5 blocks) and a good one against Dayton. He’s a sophomore and looks like a player who can’t really be consistent yet, who is just getting started. What do you expect from him in the second half of the season? Langarica is still adjusting. He was more a player between a SF and a more range of action PF in Spain but he’s 6-foot-9 and, since he’s in the US, he strictly moved to the PF position. The first issue for him was that he needed to gain muscles. He was a really skinny guy with long arms and a long body. I haven’t watched much of him last year but when I first watched him this season, I wasn’t even recognizing him: the broadcaster said his name and I was like “THAT one is Javier?!”. He has doubled in size compared to a couple of years ago. I guess he’s adjusting to the position, to the system where he has to play in, closer to the rim. He’s gaining a lot of strength and learning how to guard post players. He’s still young, I wouldn’t expect much consistency from him now but I feel he’s going to be pretty good in the future. On the other hand, there’s a guy like Valparaiso’s Jaume Sorolla who could’ve (should’ve?) make some improvements but appears to be kind of stuck: he’s a junior now and his numbers basically never changed so far (3.9 points, 3.2 rebounds in 15.7 minutes). Among all the Spanish players, he’s maybe the one I had more expectations on. I would even say that he did better last season. When I talked to him last year, he was very happy about his coach and the staff, he felt very comfortable with them, which is very important for foreign players. I was expecting much more from him in this season. I don’t know, when I watch him playing, I feel like he’s anxious to prove what he’s capable of, but with opposite consequences. He sometimes commits fouls that coaches don’t like. He has a super long wingspan and I feel he should capitalize even more on D.
Finally, a question regarding the future: in your opinion, which one of these guys has more chances to make a high-level pro career? It’s complicated. For example, shooting guards are less demanded than big guys. I see both Rubén Guerrero and Francis Alonso playing in the ACB. I don’t know if Rubén is going to have a better career because he will have more chances to show what he’s able to do. If you ask me what I’d like to, that would be Alonso. Actually, I think he could be the SG of the national team, as much as Guerrero could be the center of the NT with Sebas Sáiz next to him as a PF. I’m talking about the future, five years from now or something like that. Those are the two players who could make a high level career.